This tutu costume is a nice addition to your doll's wardrobe. It will fit 18 inch (45cm) American Girl, other American historical dolls, Gotz Precious Day Girl Dolls, Corolle Dolls, and similar size dolls. These instructions are for your doll with a 12 inch waist. And with a length from waist to knees of 5 inches. I recommend making this longer version of the tutu with the full bodied 18 inch dolls. 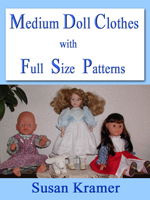 Here are pattern pieces to make the bodice for a tutu costume for 18 inch dolls such as American Girl, other historical dolls, Corolle Dolls, Gotz Precious Day Girl Dolls and dolls with similar body types. Following the instructions below make your 1 inch square graph paper and transfer the pattern markings. You may use the pattern for your own use and gifts, but not commercially. First, take an 8.5x11 inch piece of plain paper and draw 1 inch squares - I do this by drawing horizontal lines 1 inch apart down the page, and then vertical lines 1 inch apart across the page. Next, looking at the .jpg image you want to enlarge, copy what is in each of my squares into your larger squares. 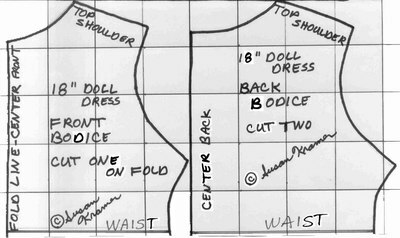 Note that on the bodice front the center front is a fold line. Hint: If you think you will use the pattern many times, cut out the pattern pieces in scraps of material or muslin for a more permanent template. - One third yard of shiny satin or acetate lining material. - 2 Velcro® dots for back closure. - Any decorations you may wish to use such as shiny ribbon in one quarter inch or very narrow widths. Also consider satin rosettes or tiny satin bows around the waistline. 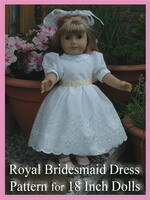 I like to sew the costumes for dolls by hand as I find it easier to manipulate the small parts. I save machine stitching for piecing together quilts for dolls and real babies. Note: The lower edge of the bodice will just overlap the waistline of the tutu, but as it is not joined in any way you could make several bodices to go with the one tutu skirt - today she's the bridesmaid and tomorrow the bride! 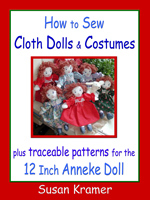 Here are sewing instructions to make the bodice for a tutu costume for 18 inch dolls such as American Girl, other historical dolls, Corolle Dolls, Gotz Precious Day Girl Dolls and dolls with similar body types. In the photo below the center front has been extended down one half inch to a point, which is one variation. 1. Cut 2 sets of pattern pieces. One set is the good material and the other set is the lining. They can be the same material if you'd like. 2. For each set, turn up the waist edge one quarter inch to the wrong side and press with a very cool iron, if acetate material, but do not sew. 3. For each set sew side seams together. 4. Line up the 2 sets right sides together and sew all around the edges except the long waist edge, which you have already turned in one quarter inch to the wrong side. 5. Clip armhole and neck seams and turn pieces right side out. 6. Blind stitch the waist seam of both sets together. 7. Blind stitch shoulder seams - they should just meet and not overlap. 8. Sew on Velcro® dots at neckline and waist edge. Decorate as desired to make the kind of costume you want - some ideas are ballet dancer, bridal gown, Cinderella, fairy or a princess. Note: The lower edge of the bodice will just overlap the waistline of the tutu, but as it is not joined in any way you could make several bodices to go with the one tutu skirt! - Two thirds yard of nylon net that is 42 inches wide. - One quarter inch elastic that is one half inch longer than waist measurement. - Decorations for the finishing touch. 1. I used a stiff nylon net material in a strip 11 inches by 42 inches (the width of the nylon net). 2. Fold the netting in half on the long edge so it is 5.5 inches wide and 2 layers thick. 3. I recommend the fullness to be 7 times the waist measurement of your doll. So, if she has a 12 inch waist you'll need to make the width 84 inches. That would be one more piece like in number 1. 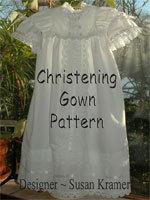 The photo above shows how your doll tutu will look with the fullness I recommend here. This gives your doll a nice full skirt. 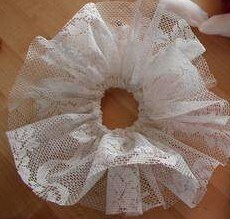 There is no need for a side seam because of the fullness of the skirt and additionally, nylon net does not ravel. 4. Next, sew a casing for one quarter inch wide elastic along the folded edge by stitching in one half inch from the folded edge. 5. Measure your doll’s waist and cut a one quarter inch wide piece of elastic one half inch longer for overlap. 6. Thread elastic through casing and stitch elastic closed. Again, you do not need to sew netting together because it is so full. If the doll’s waist is 12 inches around, the fullness of the tutu will be 7 times greater. This is full enough for the finished tutu to stand out to the sides. And, by having folded the netting in half you've made a built in lining, creating a nice fullness. Tease the layers apart after dressing the doll. To finish, pull the tutu on and decorate it if you wish. Some ideas are small bows of satin ribbon, satin rosettes, dabs of glue and glitter (tutu will not be able to be washed). This basic tutu can be used as the basis for many costume ideas, such as a bridal gown, ballet skirt, Cinderella skirt, and fairy costume.